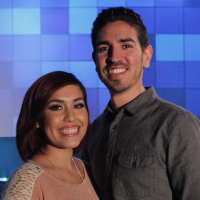 Our Youth Pastor, Chris Elguera has been happily married to his beautiful wife, Lana since 2008. They met in youth group and were high school sweethearts. In 2006, they were part of the original team that launched the church, along with Pastors Eddie and Dawna. Chris and Lana have also traveled the world spreading the Gospel through mission trips. In the early days of Rock Church, Pastor Chris and Lana served in the church in whatever capacity was needed. Soon they began to feel drawn to ministering to teenagers. In 2011, Pastor Chris was ordained as the Youth Pastor. Since then, he and Lana have lead the Youth Ministry together while Lana is part of the Worship Team and Pastor Chris leads the graphics department. Their passion is to see teens develop and grow their personal relationship with the Lord, and to discover their gifts, talents, and callings, and to transition into adults who are passionate about building the Kingdom of God. Aside from ministry at Rock Church, Pastor Chris is also actively involved in community charity with the 501st Legion and Make-A-Wish Foundation.